MR Input 211: Gesture. Gestures turn user intention into action. With gestures, users can interact with holograms. In this course, we'll learn how to track the user's hands, respond to user input, and give feedback to the user based on hand state and location. Gesture events are built on top of the W3C Pointer Events model. 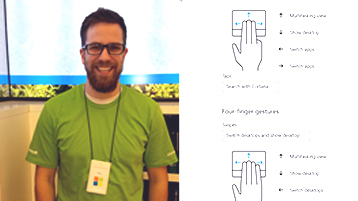 Use gesture events to help recognize and respond to more complex touch-based user interactions (such as pinch, rotate, swipe, and drag) without having to capture and interpret individual pointer events yourself.